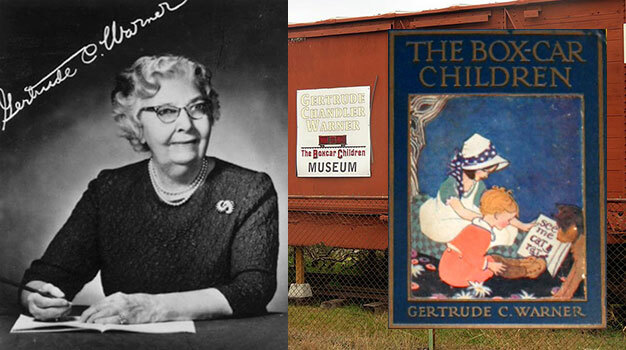 Gertrude Chandler Warner started writing when she was five years old, in 1895. She wrote The Box-Car Children when she was sick at home, recovering from bronchitis. She wrote a book she wanted to read, believing she would like to live in a caboose. That first Box-Car Children book was published in 1924. Forty years later, I would find it in my elementary school library. That story began a lifelong love of mysteries. They are my go-to stress-relievers, a place for me to get lost in a story. I particularly like a series of mysteries—because I can inhabit that world for a longer period of time. The detectives become memorable people I know well. Warner wrote eighteen books in her series about the Box-Car children. She wrote that first book nearly 100 years ago … and it persists. You can visit her childhood home in Putnam, Connecticut, and tour the Box-Car Children Museum across the street, housed in—what else?—a railroad freight car.